Every business plan should include three key financial statements: a profit and loss statement, a cash flow statement, and a balance sheet. The balance sheet is the statement that is most often misunderstood, which is problematic because it is also the most useful of the three statements. If you’re building or running a business, you’ll need to know how to read and understand your balance sheet. Your balance sheet is a financial statement that summarizes your company’s assets (what you own), your liabilities (what you owe), and equity (money invested into the business, plus profits). The balance sheet doesn’t show trends, but instead shows the financial state of a company at a specific point in time. Balance sheets get their name from the fact that they always have to balance out, based on the formula above. Assets must always equal liabilities plus equity. This might sound complicated at first, but it’s actually pretty straightforward: A company needs to pay for the things it owns (assets) by either borrowing money (liabilities) or getting money from investors and profits (equity). Let’s look at an example so you can see how this works. If your business gets a $10,000 loan from the bank, you now have $10,000 in cash in your business bank account. This is your asset. But, you also now owe the bank $10,000 which is your liability. The two sides of the equation balance out because the money you owe equals the amount of money that you have added to your bank account. If you also get a $5,000 investment, your assets will increase as you add that cash to your bank account, but equity will also increase because investors now own a piece of the company. Equity will also include all revenues the company generates in excess of its liabilities. These revenues will also show up on the assets side, appearing as cash, investments, inventory, or some other asset. The three categories here (assets, liabilities, and equity) are each made up of various sub-accounts. Depending on your industry, there can be different accounts in each section. Below, we’ll define some of the most common things you’ll see in each section. Assets are divided into two primary groups: current assets and long-term assets. Current assets can be converted into cash in a year or less. They typically include cash, stocks, accounts receivable, prepaid expenses, and inventory. Fixed assets are tangible assets that are for long-term use, such as equipment, machinery, vehicles, land and buildings, furniture and fixtures, and leasehold improvements. Liabilities are the money that a business owes to other people or businesses. These could be bills, loans, deferred taxes, and so on. Just like assets, liabilities are divided into current and long-term groups. Current liabilities are business obligations due within one year. These typically include short-term loans (including lines of credit), current maturities of long-term debt, accounts payable, accrued payroll and other expenses, and taxes payable. The equity section of the balance sheet is the sum of all shareholder/owner money invested in the business plus accumulated business profits. What does a balance sheet typically look like? Check out this example from LivePlan. Find your net worth. Your balance sheet can provide a wealth of useful information to help improve your financial management. For example, you can determine your company’s net worth by subtracting your balance sheet liabilities from your assets. Spot potential cash issues. Perhaps the most useful aspect of your balance sheet is its ability to alert you to potential cash shortages. You can look at the amount of cash you have in the bank and quickly see how much you owe your vendors (accounts payable). If your accounts payable number is greater than the amount of cash you have on hand, you’ll need to have a plan for either increasing the amount of cash you have or paying your bills more slowly over time. The current ratio measures liquidity to show whether your company has enough current (i.e., liquid) assets on hand to pay bills on-time and run operations effectively. It is expressed as the number of times current assets exceed current liabilities. Quick ratio is similar to the current ratio but excludes inventory. A quick ratio of 1.5:1 is generally desirable for non-inventory-carrying businesses, but—just as with current ratios—desirable quick ratios differ from industry to industry. You can use industry benchmark tools, such as the ones found in LivePlan, to determine if your balance sheet ratios are in-line with your industry averages. 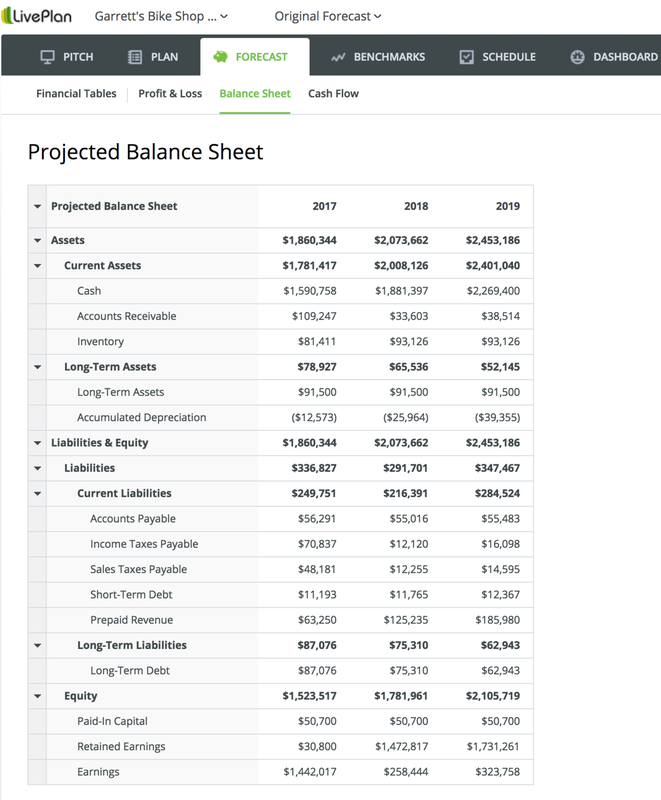 When you’re creating a forecast for your business, it’s generally much easier to use a tool like LivePlan to create your balance sheet for you; You can also download our free Balance Sheet Template and build one on your own. If you have any questions, please feel free to reach me on Twitter @noahparsons. For more business concepts made simple, check out these articles on direct costs, cash burn rate, net profit, operating margin, accounts payable, accounts receivable, cash flow, profit and loss statement, and expense budgeting. Editor’s note: This article originally published in 2016. It was updated in 2019.